Hawick RFC have announced plans to create a 2nd XV in what the club says is a bid to “realistically compete for the BT Premiership”. “I can confirm that Hawick RFC are restarting our 2nd XV as we feel it is in the best interests of the long-term success of the club,” said Cameron. The reintroduction of a Hawick 2nd XV adds to an already crowded group of teams in the town, with rumours circulating that amalgamation is a possibilityto balance the numbers. But Cameron stressed nothing has been decided, and confirmed discussions between local clubs on possible structural changes to rugby in the town had been ongoing for more than a year. He also said he is hopeful of making an announcement on the key features of the 2nd XV and other proposals in the near future. 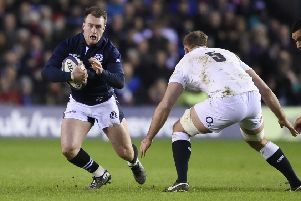 He added: “It has been a lengthy process going on for more than a year now on how best to move forward with the sport in the town between all the clubs in Hawick and the Hawick Rugby Trust. “There is still a lot of planning and negotiation to be conducted on how best to proceed, with 101 details still to be ironed out but everyone wants this to work.